I said I’d post the recipe. Then 4 weeks later and I still hadn’t posted it. 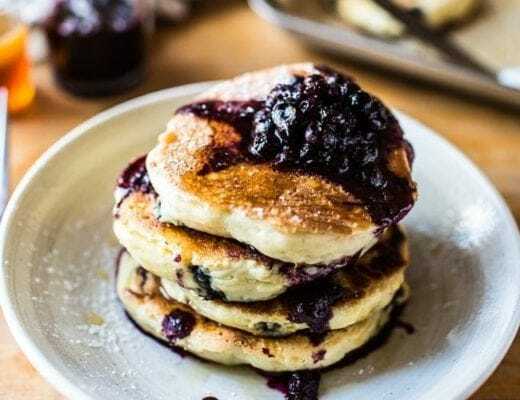 Then there were guest posts and other posts and pancakes and things. Then I felt all ‘meh’ about the photos, but finally edited them. In total it’s been about 2 months now and here we are! I’ve brought you a summer cake in autumn. How nice Izy. Yeah, I thought so. and then I end up lying on my duvet on the floor under a blanket, in my PJs at 7pm, watching Hustle and drinking tea. I think we all know who leads the glamourous London lifestyle around here. Those characters in Hustle is who. and when it comes to pumpkin time, I am not joking. Oh also guys, I realise that I have basically broken the cardinal rule of angel food cakes here – I greased the pan. I used a regular (i.e. not non-stick) bundt pan, and sprayed it with vegetable oil spray and it literally came out FINE. So there’s a baking myth busted. But if you’re skeptical, just use an un-greased, normal angel food cake pan and you’ll be a-okay. Whisk the egg whites together with the cream of tartar and salt. Continue to whisk whilst gradually adding in 1/2 cup of the sugar. Beat until the egg whites hold stiff peaks, then whisk in the vanilla and almond extracts. Sift the flour and remaining sugar into the bowl. Also add the coconut to the bowl. Fold it all together with a rubber spatula until just mixed. Pour the batter into an angel food cake/bundt cake / tube pan (if you use a bundt pan, I'd say you should grease it or make sure it's non-stick). and bake for 20-30 minutes. Leave to cool upside-down, on a wire rack. Once cool, loosen the edges with a palette knife and turn out onto a serving plate. For the frosting, stir together 1/2 cup of the yogurt with all the powdered sugar and vanilla extract. Frost the cake with this, then use the additional yogurt to spoon + swirl on top. Decorate with your choice of toppings. 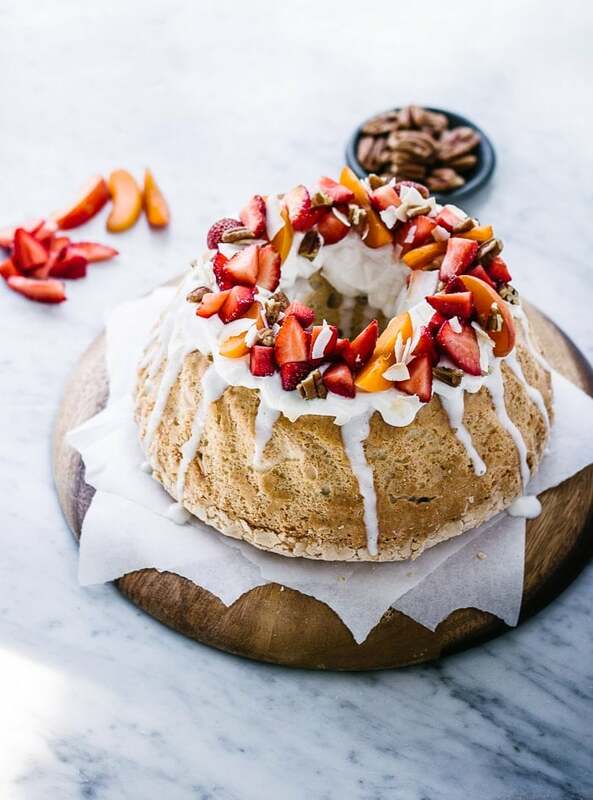 Love the coconut angel food cake concept – beautiful, delicious, and decadent. I kind of want to just jump into it. Any chance you could mail it to the US in exchange for a baked good :-)? That gif shows how awesomely fluffy it it! Gorgeous, I love the fresh fruit topping! Hahaha your posts always make me laugh!! Loving this freaking cake – yuuuuum! YOUUUUU. You poor bugger, exams are the worst! All that and YOU GREASED THE PAN! But that worked out ok. So your exams will too. And then you’ll get back to ur London lyfe. ah, what a time to be alive. I KNOW I GREASED IT WHAT AM I DOINGGG??? Beautiful pictures. I totally understand the stress of school and trying to make blogging a priority amongst a plethora of other things. But it can be done! Lol london style! you need a dance. Wonderful cake recipe! Still i have not dared to make the bundt in fear of breakage. OH gosh. This looks wonderful. I’m making it. soon. I currently look like the second picture with the “deadlines” “schedules” and “work” too. gosh darn it. Angel food cake real soon though. Ah mah werrrd. Beautiful cake, Izy!! Hope you live through these next couple week. 😉 I know you will! Looks beautiful, as always! I love your addition of coconut and using Greek yoghurt for icing! All the best for your exams and things. I’m sure you’ll get through fine! Thanks Zinny! Mmm I love yogurt with cake, such a good combo. Absolutely beautiful cake. Stunning photos. Good luck with the studies! Hang in there. Hahhahh your posts always make me laaaaffff. Good luck with all the UCAS and Personal statement shizzles – hang in there!! I am! It’s almost done. ALMOST. Lovely lovely cake, perfect timing for us down here in Australia! Strawberry seasons is in full swing! ahah, I can’t wait to forget them. Thanks Emma, I never thought about the different seasons in different parts of the world (duhhh) – yay! I know the feeling gurrrlllll!! I just started uni last week and I’m already stressed. So much to do and I haven’t even got coursework yet:( what are you studying? Btw cake look delicious, love the fruity topping. ahh man, good luck with Uni! I’m doing Chem, Bio and Maths. So no essays! But lots of calculations and coursework. As always, your photos are awesome. I saw angel food cake being made on GBBO and it looked really tricky, but maybe they they are just being over-the-top for TV. I love the yogurt frosting idea! I make ice cream, and sometimes I do the custard base which uses egg yolks. This cake recipe is perfect for the leftover eggwhites. Not sure why this never ocurred to me as the egg whites sat moldering in the fridge. Duh. So thank you for this…..and your gorgeuos pictures, and your sense of humor, and your fearlessness in the kitchen. Cannot wait for the pumpkin things. 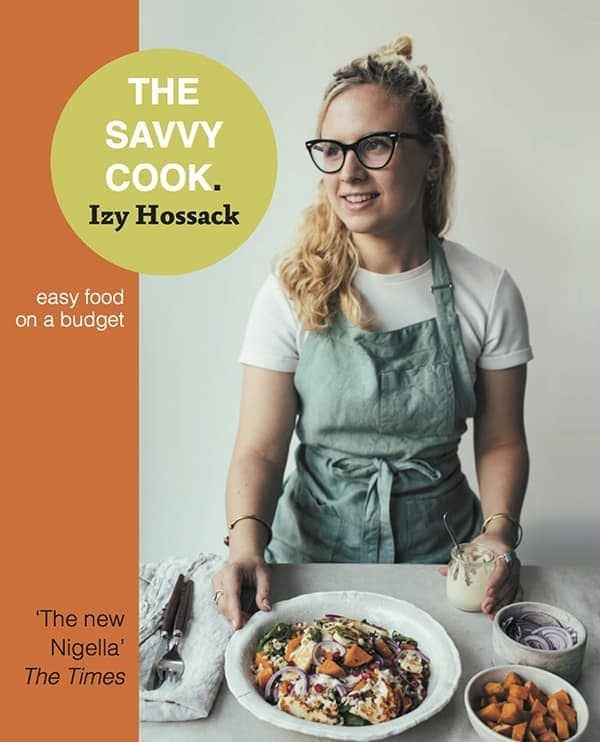 You are an inspiration for an oldster just learning to enjoy cooking. I always forget about all the recipes for using up loads of egg yolks / egg whites and inevitably throw them away :/ soooo it’s not only you! You could post this cake in the dead of winter and I will still be ALL OVER THAT MO’. Definitely will be making this when I get a chance. I totally get where you’re coming from about school – I’m in the same year as you so everything is stressedout.com at the moment! But baking makes everything better! ugh yes. Why is UCAS such a long, precise form? I keep getting so confused!!! You rebel, you. Girl, I just had exactly 6 egg whites I needed to use up and that was THREE DAYS AGO…….so. We’re going to have to talk about this timing thing. As in we should really coordinate our schedules and you can feel free to send this angel cake to my doorstep as reparation, okay? 😀 so fluffy, lovin’ it! I LOVE LOVE LOVE your blog and this recipe is just amazing! I love the personal touch you add and that everything is so darn pretty! We should be blogger besties! I mean, could your pictures be any prettier and could this look any better?! heheh, thanks so much Abby! Baaaha, your posts are always so sweet and funny. Honestly, I always wonder how you do it. Being so busy at school and still finding the time to not only bake those amazing things but also taking those amazing pictures of all the amazing things you bake PLUS finding the nerve to upload all the stuff and post it in such a funny, entertaining way. Me too haha, but somehow I just make time for it! Your posts always leave me laughing. LOVE! The photos of you are hilarious. I completely understand the crazy times, but you are doing an amazing job, girl! Keep at it. 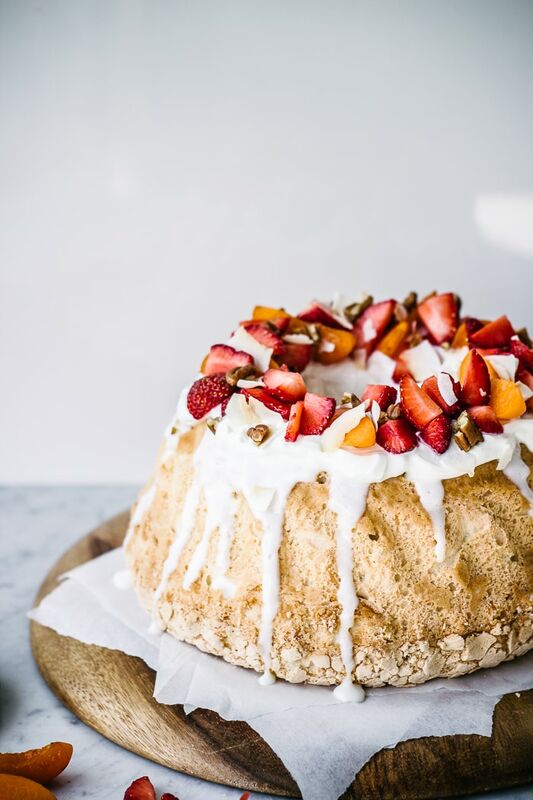 And, I’ll take this summer cake any day…or season. It’s friggin’ gorgeous. So beautiful! I love the colors of this cake….But I love the idea of how it tastes even more. Greek yogurt = ftw! And that cake-cutting gif – O.M.G. I’ve got to make some angel food happen in my kitchen stat. Thanks so much Eva! yusss the Greek yogurt is sooo good with the cake because it’s all tangy and creamy! Pretty pretty pretty! I don’t care what season it is, I want to eat this. thanks Kathryn 😀 me too! cake all year round yaaaay! Wait…you’re not supposed to grease the pan?.. 😉 I’d be down with this cake all day errday.. no matter the season. izy, it is beyond me why anyone would post anything REMOTELY negative on this gorgeous website. the equivalent would be to punch a cute kitteh in the face. WHY? well I think some people like punching kittens then 🙁 only rarely though! 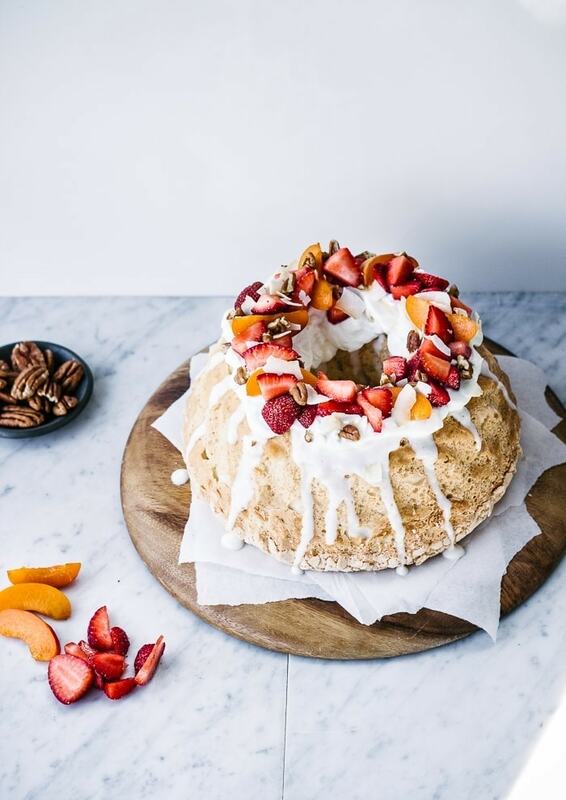 Yuusssssss, the angel food cake! You know I love angel food cake + strawberries + whipped cream, but that Greek yogurt frosting takes it to a whole ‘nother level of friggin’ awesome. SUMMER FOREVER. I’ll eat pumpkin soup for dinner and five slices of angel food cake for dessert. HAHA I KNOW FINALLY RIGHT!? Yayyy balance those seasons out like a pro! ughh you just put into words how I’ve been feeling for the past few months! haha winter is totally like blogger season! THANK YOU FOR THIS!! !….My absolute FAVORITE cake…which hubster detests…made with a REGULAR BUNDT PAN! !…Not only have you disproved the angel-food “absolute” of never greasing…but I thought that here in France, I would NEVER be able to make this (angel-food cake pans are hard to find here)!! 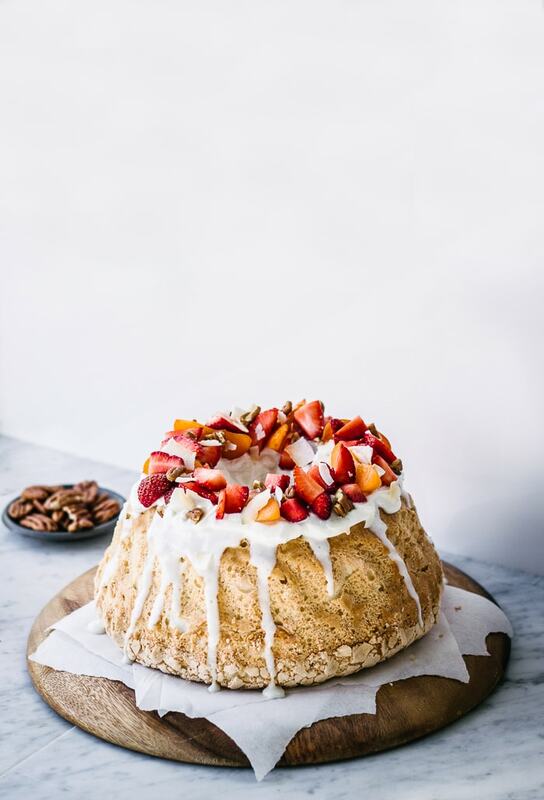 Love its lightness…your fresh, minimal fresh fruit and greek yogurt topping….This is gorgeous…as is your humour and stellar photography…Consider me a fan!…Thanks to Jessica via “How Sweet It Is” blog. Ah mah gawd. I have to have this!!!!!! This cake is. so. gorgeous. Ohh my goshh, i-need-this-cake!! Right now i mean coconut and frosting and fresh fruits and that fluffiness and and… Definitely gonna try this at weekend. But… Would you have any idea what could i substitute cream of tartar with? And what amount? It’s just impossible find it here for some reason. I would be so grateful! Holy cow this sounds incredible! Can’t wait to try this; thanks for sharing!! 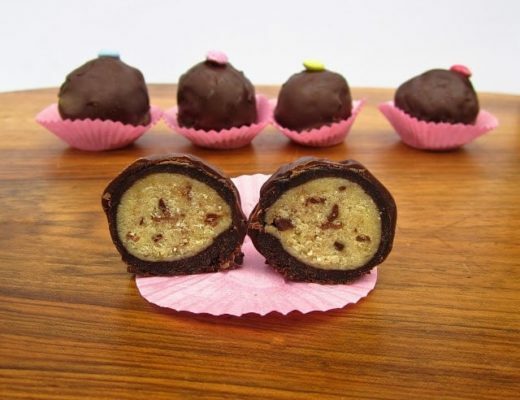 Feel free to visit my recipe site http://www.BetterOffHealthy.com. That looks so tasty. I need to a piece of fruit or something or there’s a 90% chance I’ll have cake for lunch. 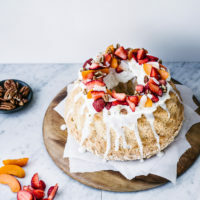 The only time I made an angel food cake I use a special pan that allows space for the cake to fall, didn’t grease, correctly whipped whites, bla bla.. and it was a flop, big time. So I’m going with greased bundt next time. Girl, that cake looks so good you could make a convert out of me! Last time I made angel food cake, it turned into a pile of cake bits that I had to glue back together with boiled icing. So yours looks pretty good. Even if you greased the pan. Hi! Cake looks gorgeous! I’m gonna make it for my friends birthday, but I just had one question – did you use a smaller bundt pan? The recipe calls for 6 egg whites and usually angel food cake can use upwards to 10 egg whites. Thanks! Thank you! Hmmm, It was a regular sized bundt pan, but I think that the cake wasn’t as tall as a normal angel food cake. This recipe is AWESOME! I have never made an angel fook cake from scratch. It was my co-worker’s birthday and the whole office went gaga! Hehehe! The greek yogurt topping really takes this cake to another level of yummy goodness. Thanks! I might be in Australia…but this was totally my life in Year 12 (my final high school year) AND I bloody love Hustle. BEST SHOW EVER! I searched far and wide for a tasty cake recipe that wasn’t loaded with sugar for my son’s first birthday smash cake. He’s now 3 and I’m making this cake for the third time 🙂 The whole fam loves it! Thanks Izy!